Thanks to the efforts of Erinn Gavaghan, the tigress of the Norman Arts Council, and all the other lovely people who helped make the Fund a reality, I'm proud to announce that we raised enough in the inaugural year of the O. Gail Poole Memorial Travel Fund to allow four Norman artists to expand their horizons by virtue of travel. It is strange to go from being a scholarship student myself to administering a fund, but I definitely feel wonderful about giving back to the community who supported my dreams, and of whom my father was an integral part. I can't wait to see the fruit yielded by the experiences these four artists will have, and I thank you all for your donations; from the folks who contributed $5 to those who were able to give hundreds, together we are making a difference in artists' lives, and bettering the community of Norman, and by proximity, Oklahoma at large. The NewsOK.com article is here. I am determined that this fund continue in perpetuity, and urge you to pledge your support; the amount does not matter. It's all tax-deductible, and is only one click away. NORMAN — Norman Arts Council announced that the winners of the first round of $500 awards from the O. Gail Poole Memorial Travel Fund are Marwin Begaye, Chris Fleming, Debby Kaspari and Craig Swan. 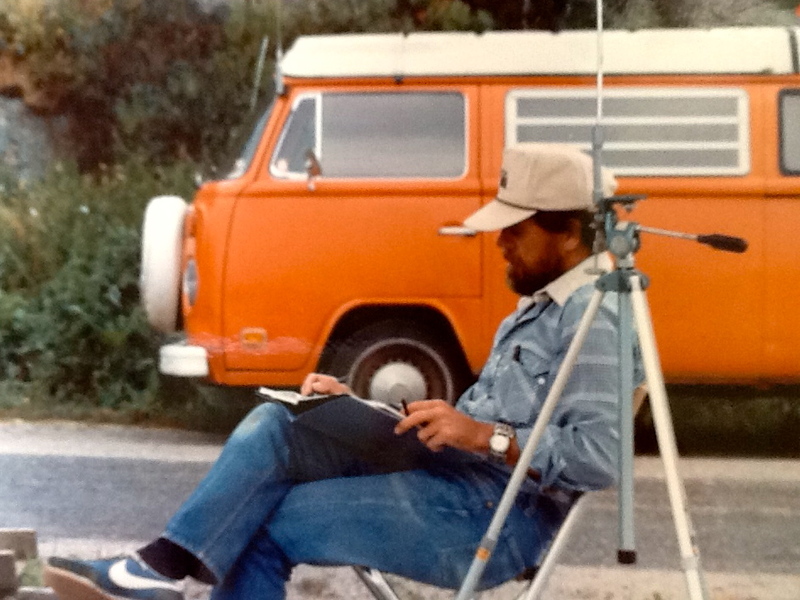 Nicole Poole, in remembrance of her father and his love of travel to further artistic practices, established the fund to be administered by the NAC. The fund is to benefit artists of demonstrated merit and ability. Begaye is using the award to attend an international, indigenous contemporary visual arts gathering in New Zealand, where he will participate in workshops and exhibits in addition to leading a printmaking workshop. Fleming attended an intensive, three-week workshop at the Anderson Ranch Arts Center in Snowmass Village, Colo.
Kaspari is inspired by Poole’s landscape work and plans to pursue a study of plein air painting by immersing herself in Medicine Park. Swan is taking an artistic pilgrimage to New York City to self-evaluate, gain inspiration and plug into the art scene. Those interested in donating to the O. Gail Poole Memorial Travel Fund can contact the NAC by calling 360-1162 or e-mailing nac@normanarts.org. Donations also can be made at normanarts.org.